• Pre-ishial bar prevents sliding forward | Converts shear into normal forces. 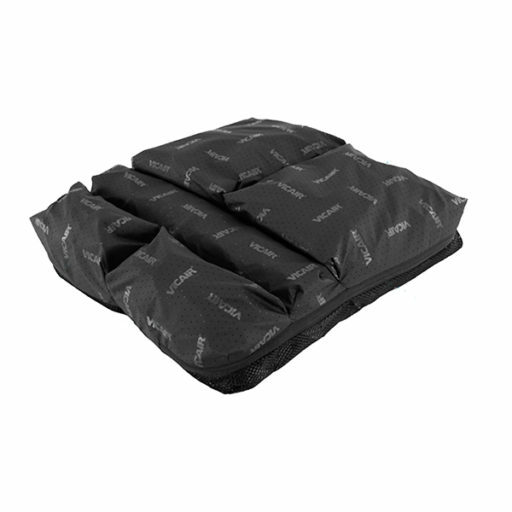 • Total immersion for equal pressure distribution | Support IT-coccyx area | Managing pelvic asymmetry. The Adjuster O2 is extremely suitable for use with asymmetric body contours and amputations. It automatically manages small obliquities and is individually adjustable to support more extreme asymmetry. When you’re looking for a high comfort level, optimal skin protection and stability: the Adjuster O2 is always a safe choice. The design allows total immersion to equally redistribute pressure and prevents sliding forward. 100% machine washable and breathable, for optimal hygiene and perfect temperature and moist regulation. As a result the Adjuster O2 offers you optimal protection against skin breakdown. Hemiplegia (CVA), amputations, foot propulsion, kyphosis, pelvic obliquity/tilt/rotation, Spina Bifida, spasms, Fibrodysplasia Ossifican Progressiva (FOP).